Enormous increases in the demand for power throughout the world make it imperative to reduce the environmental hazards and pollution associated with power generation. This book discusses the effects that power generation has had on the land, the water, the air, and the biosphere. It reviews the technological means available for abatement and control of damaging environmental effects and describes power generation techniques that could prove more compatible with the environment.To meet the growing demand for power in the United States, generating capacity must be doubled in the next ten years. Plants scheduled to be retired in that interval must also be replaced. Although there are promising, advanced techniques for generating power more efficiently and more cleanly at some future time, the problem at hand is how to construct the needed capacity for the next twenty years. This book focuses on those newer techniques which in realistic engineering terms show promise of large-scale application in that period of time. The primary means of generating power are nuclear, hydroelectric, and fossil fuel. What effects do these have on the environment? Nuclear generating plants and nuclear fuel processing plants release radionuclides in a variety of gaseous, liquid, and solid chemical forms. Hydroelectric dams drastically alter the landscape and produce direct change in the ecology of life systems. Fuel combustion pollutes air with smoke and oxides of sulfur, nitrogen, and carbon. Mining activities scar land and pollute rivers. Nuclear- and fossil-fueled plants waste more energy than is contained in the usable power that they produce; most of the wasted energy warms lakes and rivers whose waters are diverted for cooling purposes. What can be done to control these widespread environmental effects? One proposal in this book is to encourage reduction of radioactive wastes from nuclear power generation by reducing the federal guidelines for radiation exposure of the population. This subject is particularly controversial. In separate chapters, the bases for the federal guidelines are questioned and supported by the respective proponents, and the technology for control is reviewed. Another proposal suggests wider application of improved combustion techniques for coal, the most abundant energy resource. Pollutants that formerly went up the stack can now be removed earlier in the process of combustion. Coal is also a source material for gaseous and liquid fuels, for which natural supplies are dwindling and to which our fuel economy is heavily committed. Man's desire for power must be reconciled with the needs of his environment. 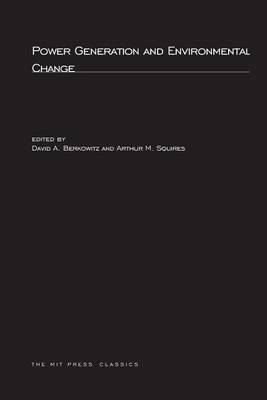 This book presents the many and varied relationships between power generation and environmental change and provides a basis for understanding the consequences of increased power generation capacity.